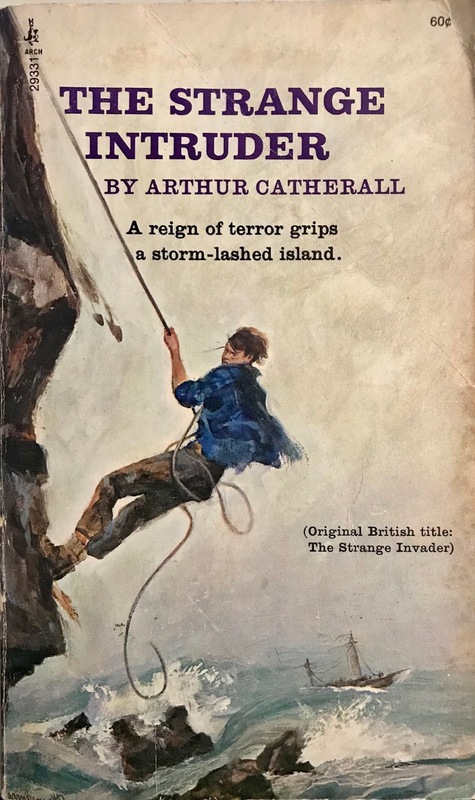 Arthur Catherall (1906-1980) was an adventurer at heart. From climbing mountains in Lapland and Algeria to sailing trawlers in the Atlantic and Arctic, the British author certainly had many life experiences to inspire his literary work. Utilizing over six different pseudonyms, Catherall wrote a high volume of young adult novels like “The Strange Intruder”. This sweeping 1964 adventure tale was first released as “The Strange Invader” before being reprinted by Archway as “The Strange Intruder” in 1968. While never specifying a time period, the novel seems to be set in the present day (1964). The wind-swept location is the chilly Faroes Islands, geographically positioned north of the British Isles and just Southeast of Iceland. In the book's opening pages we read that the 900-ton schooner Faroes Seeker has struck an old wheelhouse assembly and torn the ship's hull. Miles off coast, the crew becomes stranded and forced to use battered sails on storm-ravaged seas. The book's young protagonist is Sven Klakk, a 16-year old fishermen learning the trade with his uncles. He's part of a small village living on the islands and has enough experience with a plethora of rigging, climbing, fishing and...adventuring. In some ways Sven is the life of the island, always there to help the elders while slowly evolving into a full-time role as statesman. Sven and his father see the ship and eventually round up the village to start making supplies available for the surviving crewmen. In a wild turn of events, the villagers spot a crew member jumping from the ship and swimming to a storm-battered enclave. Sven, panicking to save the swimmer, races to the cliffs and the narrative really builds steam as we learn the crew member is actually a polar bear escaping captivity from the ship. Once Sven meets the bear...the fight is on. With very little supplies, an old shotgun and the storm raging on the island, the story has Sven and the villagers fighting off a ravenous polar bear that's angry out of his element. Like most of Catherall's work, this is a coming of age tale about a young man saving his village. Metaphorically, the bear is Sven's own childhood raging to break free. With the backdrop of swollen seas, rocky cliffs and island life, the author creates a vivid, enjoyable adventure read for anyone. I'm passing it on to a 67-year old to read next. The kid in us never really ages.